Bienvenido! Welcome to Quito, the capital of Ecuador that sits right on the equator. You will be met and transferred to your boutique hotel. Walking tour of the colonial centre of Quito. Make your way to the middle of the world to put one foot on both sides of the equator, then visit the Intiñan Museum. Fly to the Galápagos Islands where you will begin your Galápagos cruise. Sailing schedule varies depending on your vessel and local conditions. Your cruise will visit various islands, beaches, bays and inlets to reveal the bounty of wonders in Galápagos. Each day, you will be taken on guided walks, excursions and boat tours to discover the unique landscapes and wildlife. You will have the opportunity to see the giant Galápagos tortoise, sea lion colonies, green sea turtles, land and marine iguanas, and a variety of bird life including the famous blue-footed booby. Note: Daily cruise schedule is subject to change. Your cruise will visit various islands, beaches, bays and inlets to reveal the bounty of wonders in Galápagos. Each day you will be taken on guided walks, excursions and boat tours to discover the unique landscapes and wildlife. Bid farewell to this natural wonderland and fly to Lima, Peru, home of ancient civilizations, rich cultures, majestic ruins, snow-capped mountains and fertile jungle. This afternoon, enjoy a city tour of Lima. See one of Lima’s ancient pyramids, visit the main plaza and enter the 16th century Santo Domingo Church. You’re Invited: Tonight, take a guided tour of the Larco Museum which houses Inca and pre Inca artefacts. Afterwards, enjoy a traditional dinner at the museum. Fly to Iquitos. Board the luxurious MV Zafiro for a three night cruise on the Amazon River. Float down the Yanallpa River and spot wildlife as you travel through a “gallery forest”. Move into the Tapiche River where you’ll disembark and take a jungle walk. In the afternoon, explore the Dorado River through the “Mirrored Forest” that reflects the surrounding scenery. Sail along the Yarapa River which is a known playground for grey and pink river dolphins and contains a vast variety of wildlife. This afternoon, visit a local home and learn how to cook traditional Amazon cuisine. Watch the sunrise over the Amazon River, then travel to a Manatee Rescue Centre. See how the manatees are cared for and prepared for re-introduction into their natural habitat before your flight to Lima. Fly to Cuzco, the ancient Inca capital. Drive to the Sacred Valley, stopping off at Awana Kancha llama farm, then head to the colourful town of Pisac with its traditional markets. Enjoy a walking tour of Ollantaytambo. You’re Invited: Visit a local community which will give you the chance to meet the students and teachers at the local school. Drive to the agricultural terraces at Moray whose function remains a mystery. Nearby, under the town of Maras are salt mines that have been built into old terraces. Tonight, enjoy a traditional Andean feast. Board the Vistadome train for the journey to Machu Picchu. Mystery still surrounds these ruins and your expert local guide will share stories and knowledge to reveal some of the mysteries of this “Lost City of the Incas”. Return to Machu Picchu and further explore the ruins. Board the Vistadome train back to Ollantaytambo. Return by coach to Cuzco. Tour Cuzco, the former capital of the Incas. Visit the Inca temple of Coricancha, head through cobblestone streets and past ancient Inca buildings to Cuzco’s fascinating central market. Explore Inca ruins including the fortress of Sacsayhuaman, and finish with a visit to the main plaza and its surrounding cathedrals. Today is free to explore Cuzco. Make your way to Lake Titicaca, the birthplace of the Inca Empire. Along the way visit the village of Andahuaylillas before arriving in Puno on the banks of Lake Titicaca. Enjoy an excursion to the unique floating islands of Uros. These islands are made of the hollow totora reeds which allow them to float. Journey to Colca Canyon, one of the deepest canyons in the world. Travel along Colca Valley to Cruz del Condor, a spectacular viewpoint which allows you to appreciate the canyons depth and is the perfect point for viewing the condor. Make our way to Arequipa, known as the “White City”. Explore Arequipa visiting the Plaza de Armas and Basilica Cathedral of Arequipa, Santa Catalina Monastery and the Andean Museum which houses the famous mummy “Juanita”. 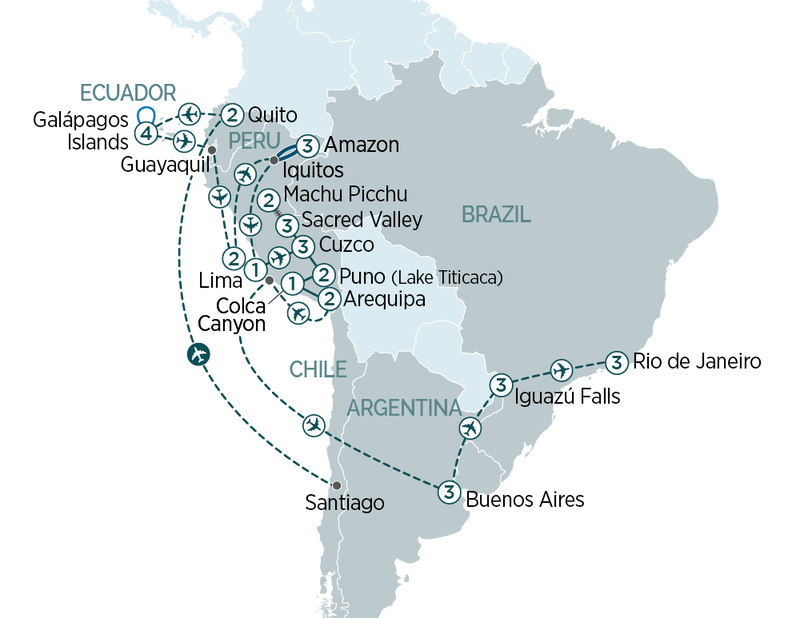 Fly via Lima to Buenos Aires, Argentina, a country with strong European influence. Visit the central square, a traditional café, San Telmo neighbourhood and the colourful area of La Boca. Finish at Recoleta Cemetery, an amazing above ground cemetery. You’re Invited: Soak up the sultry moves of a tango show accompanied by dinner. Explore Buenos Aires at your own pace. Fly to Iguazú Falls set in a tropical jungle. Tour the Argentinian side of the falls. Board the ecological train and ride to the ‘Devil’s Throat’ viewpoint, one of the most spectacular views in Iguazú. Tour the majestic Brazilian falls. Make your way up close to the base of the falls for outstanding views. This afternoon, take an exciting Macuco boat adventure. Fly to Rio de Janeiro and famous Copacabana Beach. Rio is a city full of life, colour and vibrancy. Tour Rio de Janeiro. Ride the cogwheel railway up Corcovado Mountain to the ‘Christ the Redeemer’ statue, then take the cable car to the top of Sugarloaf Mountain for amazing views of the city. You’re Invited: Visit the Sambadrome, the site of Rio Carnival where we try on some carnival costumes. Day free to explore Rio. This evening, feast like a local with a typical Brazilian Churrascaria. Transfer to the airport for your onward flight. Chau! # Sambadrome maybe closed due to Rio Carnival period. Uncover the wonders of Peru with this 26 day tour including a 4 night luxury Galápagos cruise, 2 nights in sacred Machu Picchu, an Amazon Lodge stay & more. Discover the unique wildlife of the Galápagos Islands, venture into the Amazon rainforest & tour the famous city of Machu Picchu on this 26 day journey.